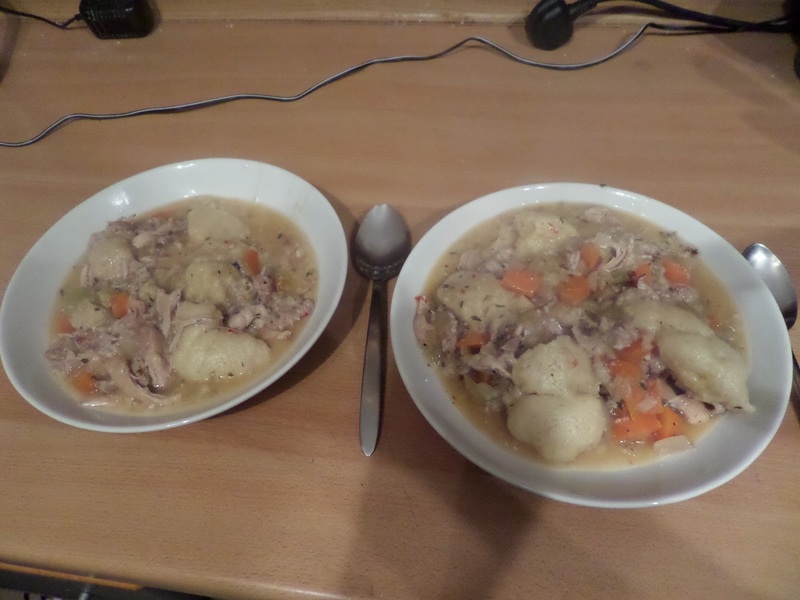 Another ATK Comfort Food Makeover today: chicken & dumplings (p126). Pat chicken dry, season, and brown on both sides in casserole . Transfer to a plate. Fry veg, then deglaze with sherry & red wine vinegar. Add stock and chicken and simmer until chicken is at least 79.5C (45 minutes). Remove chicken, cool a bit, and shred. Whisk dry together, whisk wet together, mix both together. Scoop tablespoon sized portions into stew. Cover casserole lid on bottom with teatowel and cover (it stops condensation dripping on dumplings). Simmer for 15 minutes and serve! This tastes so rich! You’d never know it was a healthy makeover. OK… maybe you would… but it’s cold, wet and windy here, and this hit the spot with deep chicken flavours and lots of gooey dumplings.